The fashion jewelry of Madison L is renowned across the globe for their classic yet fashion-forward earrings, necklaces, fashion rings, and fashion bracelets. They thrive off their commitment to excellence in service and quality in all their fashion jewelry pieces. Derived from a combination of Madison Avenue and Luxury, Madison L is a second-generation and family-owned jewelry designer who’s focus on craftsmanship makes their pieces stand out from the ordinary. With pieces available in different gold metals and using top quality diamonds and precious gemstone, every piece is hand designed and expertly brought to life to grace the fashionistas of today. The Madison L Essentials collection available at Merry Richards Jewelers boasts a stunning selection of fashion rings and earrings with varying hues of gemstones from the daring black quartz to cool light blue topaz. These essential pieces are show-stopping and stunning, and are a much-needed piece to any high fashion ensemble. 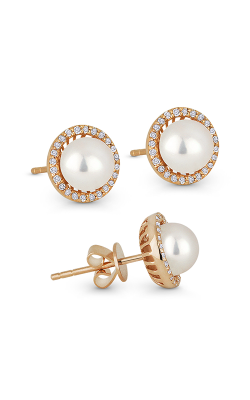 For an even more classical approach, pearl is used to great effect in their Pearl Essential collections, using only the finest pearls in earrings and fashion rings to bring this timeless fashion icon to your jewelry collection. Inspired by the looks and designs of one of Italy’s finest cities, the Milano collection incorporates extravagant metal work with many pieces elevated with stunningly brilliant diamonds. These pieces are known for their aesthetically appealing designs and devotion to capturing the style of one of the most fashion rich cities. More inspired pieces can be found in their Stiletto collection, with necklaces, bracelets, and earrings capturing the classy stiletto look that are elevated by their use of hypnotizingly black onyx and sky-blue turquoise stones surrounded by side diamonds to bring these pieces to a inspiring levels of luxury and class. Why Shop for Madison L at Merry Richards Jewelers? Synonymous with the finest cut diamonds, Merry Richards Jewelers located in Oakbrook Terrace, Illinois brings high-fashion and inspiring luxury to the Northbrook, Hinsdale, Evanston, and Naperville area. We sell only the highest in quality diamonds in our exclusive showroom and carry only the top in today’s designer jewelry. Since 1985, our expertise as a fine retailer of jewelry items has allowed us to help countless customers find their dream jewelry piece. We are an Authorized Dealer in Madison L, and provide layaway options to help you get the piece you want when you want it. Come explore our exciting selection of Madison L fashion jewelry and more online or in store.